SOLAR ELECTRIC CATALOG & DESIGN PLANNER, free for the asking! We never give your address to other mailers, so you will not receive a bunch of junk mail! 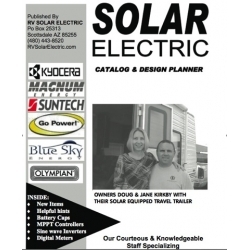 Catalog subscription policy: Solar Electric Catalog is published once a year. If you would like to receive next year's issue, return the subscription card when it is time to renew. This annual publication will assist you in designing and selecting equipment that will allow you to be Electrically Independent. HOW TO DOWNLOAD: To download this free resource, please add this product to your shopping cart. You will need to set up an account. After processing the order you will then return to your account. (There is an account tab near the top right of the webpage.) From your account profile select My Orders and Downloads and select download. If you do not want to create an account with RV Solar Electric, you can contact customer service using the link at the bottom of this webpage.